This post card, dated August 30, 1910, depicts the North Newark depot of the Erie Railroad’s Greenwood Lake line. The station is incorrectly identified as being on Broad Street, not Belleville Avenue, the former name for Broadway. The North Newark station, in fact,was close to Belleville, Newark’s northern neighbor . 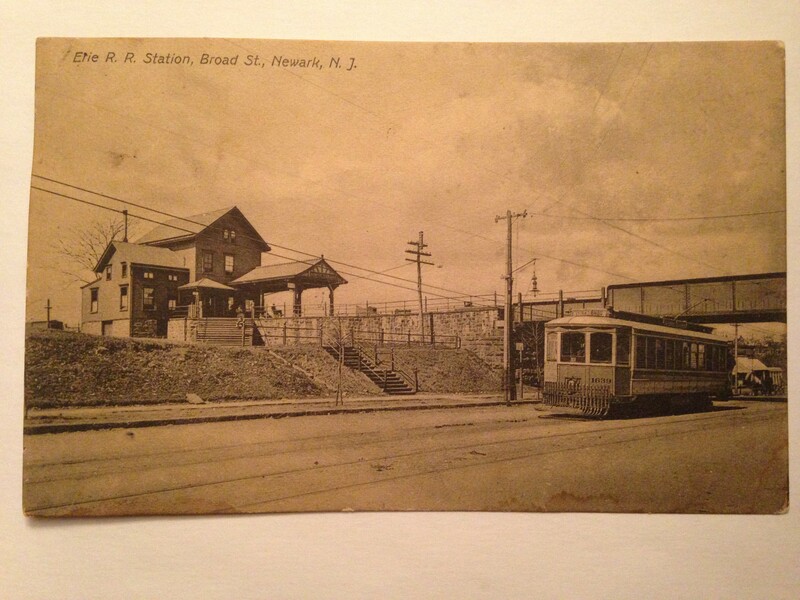 The Broad Street Station , on the other hand,was a depot of another railroad entirely, the Delaware Lackawanna and Western Railroad and was located in downtown Newark. This would certainly have created confusion for anyone not familiar with Newark or its train stations. As for myself, I find published post cards with identification or location errors very interesting, especially when I am able to spot the error. The sender of the card indicated that she was heading downtown ” to see the sights”. The site of the now demolished station is about 200 feet northwest of the intersection of Broadway and Verona Avenue. I apologize for using a Google Earth screenshot. I will replace it with a photo of my own as soon as I’m over a cold.